--- "Let's make some soup! --- what can we put in our soup????" --- CHOP CHOP CHIPPITY CHOP CUT OFF THE BOTTOM AND CUT OFF THE TOP WHAT WE HAVE LEFT, WE'LL THROW INTO THE POT CHOP CHOP CHIPPITY CHOP. --- "GET YOUR STIRRERS READY!!!" --- Sing a melody while stirring with arms ... repeat twice using other body parts ... take a taste ... do while sitting first ... standing next time. --- HOLD BABIES AND GENTLY STIR THEM. --- With slide whistle, start in crouched-down postiion. Children rise up and down to sound of whistle. --- With slide whistles, adult makes different sounds and children echo back with their pretend whistles. 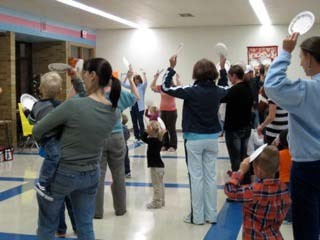 --- With recorded music that has distinctive patterns, move arms in a different manner for each pattern.